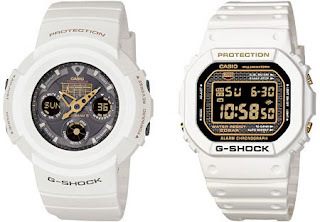 A Rinkya Blog: Casio G-Shock Anniversary Editions! 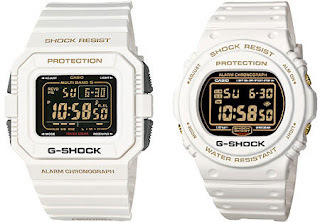 Casio Japan celebrates their 25th anniversary with the release of G-Shock special edition watches. The four special watches are white and gold, the LCD is black background and the numbers are shown in gold. Only available in Japan and packed in exclusive boxes. G Shocks on BuyRinkya- buy today!